Preseason finale for the Silvertips and Seattle Thunderbirds … a renewal of the closest rivalry in the U.S. Division by geography, separation of 45 miles between Everett and Kent, Wash. … both matchups, previously, have gone to overtime … the Silvertips are 1-0-1-1 at home in the preseason … the Silvertips went 6-2-0-2 last season against the Thunderbirds in the regular season, and defeated Seattle 4-1 in the opening round of the WHL Playoffs. SEA 4 – EVT 3 (SO) (9-11-18): Blake Lyda made 40 saves in 65 minutes of action and Bryce Kindopp scored twice, but Payton Mount’s goal in the ninth round helped the Seattle Thunderbirds sneak past the Everett Silvertips, 4-3 in a shootout at accesso ShoWare Center in preseason action on Tuesday. 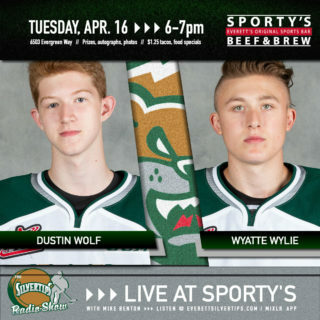 The Silvertips moved their preseason record to 2-1-1-2, missing a quartet of returning players with NHL training camp commitments, Connor Dewar, Riley Sutter, Jake Christiansen, and Wyatte Wylie. The Silvertips rallied from a two goal deficit in the second period and a one goal deficit in the third period. 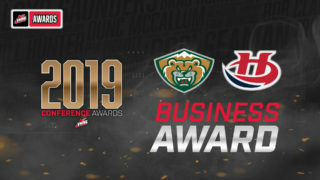 CAN’T WAIT FOR THE REAL THING: The Silvertips will enter the season as defending Western Conference champions (second time in franchise history) … they won their sixth U.S. Division title in 15 years … they had 99 points last season, third highest in franchise history. TORRID TIPS: The Tips won 37 of their final 48 games … they scored a franchise record 246 goals … the Silvertips had 5 games of scoring 8 goals or more in the regular season … for the first time in franchise history, they boasted seven different 20-goal scorers on the roster, led by Connor Dewar (38) … in their 8-4 over Tri-City in Game 3 of the Western Conference Championship series, they set a new franchise playoff record for most goals in one game (8). 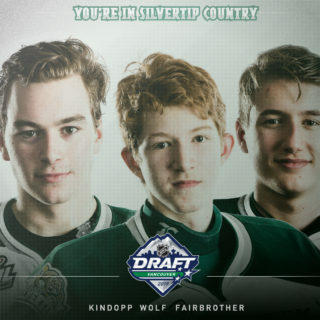 NHL TIES: The Tips have four players currently skating in NHL training camps – defensemen Wyatte Wylie (Philadelphia) and Jake Christiansen (Calgary), and forwards Connor Dewar (Minnesota) and Riley Sutter (Washington). EVERETT EARNS MORE HARDWARE: At the WHL Awards in Red Deer on May 2, goaltender Carter Hart became the first Silvertip in franchise history to earn the Four Broncos Memorial Trophy (WHL Player of the Year) and first in league history to earn the Del Wilson Memorial Trophy (WHL Goaltender of the Year) three straight years … Tips general manager Garry Davidson became the first in franchise history to earn the Lloyd Saunders Memorial Trophy (WHL Executive of the Year) … the Tips were nominated as Western Conference Marketing/Business Award recipient, and head coach Dennis Williams was the Western Conference Coach of the Year … Goaltender Carter Hart was WHL Western Conference First Team All-Star and Patrick Bajkov was Western Conference Second Team All-Star. 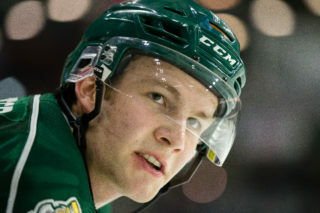 BIG & RICHARDS: Tips overager Sean Richards has points in five of six preseason games … Richards had the first Silvertips goal and an assist on Tuesday in Kent. 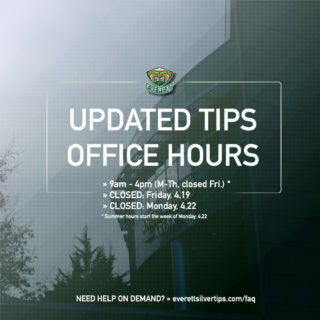 AT HOME: the Tips last season had 25 wins, second most in the Western Conference … they allowed just 77 goals, fewest in the entire league … their penalty killing was first in the WHL, at 86.7 percent … the Tips went 19-0-2-0 when leading after two periods and 5-1-0-1 when tied after two periods … they led in shots on goal for 31 of 36 home games.